This has been the most relatable book I have ever read. I really identified so strongly with so many aspects of the book; the strong association of food with a grandmother, the difficulty committing to a choice (despite being completely repulsed by factory farming), the emphasis of shame, and the transparency. I was vegan for one summer and I was vegetarian for six years. I had two hotdogs yesterday and I just ate some chicken nuggets like 15 minutes ago. I am deeply ashamed, but I’m also allowing myself to want meat and to experience the complexity of that contradiction. Vegetarianism is a very complicated thing because food is super complex, especially as you delve into things like American culture, how we you were raised, if you have some heritage which particular foods are important? My family is Cuban and Italian, so according to them, pork is the best, seafood isn’t meat, and how do you live without chicken? The current goal is for me to do a training on Saturday, or next Saturday, and then to run the Innovative Organics Recycling tent with Janelle on the Saturday following training. I am also going to spend more time focusing on how to make sure the student/IOR/Delaware Farmers’ Market relationship is sustainable. 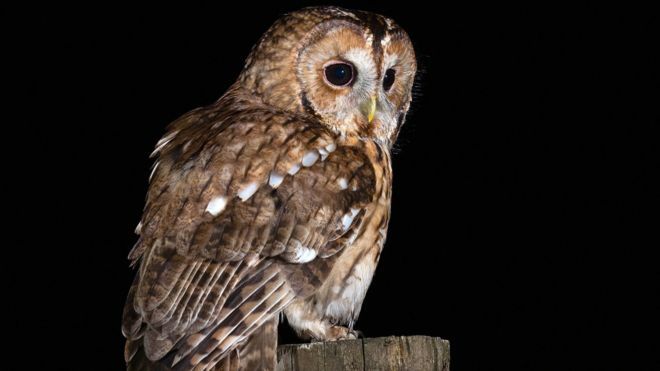 The Tawny Owl, whose call sounds like “twit-twoo” experiencing population decline. This is most likely from urbanization, habitat loss, and light pollution. The British Trust for Ornithology is asking people to listen for the call and to record it in a survey to help monitor the population. There are 50,000 breeding pairs left in England and they like to live in forests and, recently, parks. This entry was posted on Wednesday, October 3rd, 2018 at 4:00 pm and is filed under Uncategorized. You can follow any responses to this entry through the RSS 2.0 feed. You can leave a response, or trackback from your own site.